'The Hobbit' is a cherished book for me. I have several copies of it; a hardback in a slipcase, like this, and an annotated copy like this, as well as a paperback copy, plus a small pocket hardback that I have temporarily misplaced, as well as access to Isaac's rather magnificent hardback slipcased collection of The Hobbit and Lord of The Rings, which he received a few years ago at Christmas. Obviously that is several more copies than strictly required for the purpose of reading a story, no matter how enjoyable, but I do take great pleasure in reading the same words in different editions, to see where a favourite phrase or paragraph sits on the page in a particular hardback or paperback. Whilst my journeys this summer have not involved gold-hungry dwarves, fire breathing dragons, or flights on the back of giant eagles, they have in their own way been as unexpected as Bilbo's, and have the added piquancy of not being fictional. In the Spring, I bought a ticket to see James Taylor at BST in Hyde Park, on July 15th. As a bonus, Bonnie Rait was playing with James, and it was also Paul Simon's last UK gig as part of his final tour. The day at the festival was to be wrapped within four or five days of solo pottering around London, a long cherished ambition of mine. The hotel was booked, plans involving the Persephone Bookshop, Liberty of London, Fortnum and Mason and the Foundling Museum were made, as well as booking tickets to the ABBA exhibition at the Southbank Centre, and I began to feel very excited. Then some unexpected, hefty domestic expenses in early June left us reeling, and my London plan came crashing down in pieces. The money earmarked for my trip had to be diverted elsewhere. Swallowing my disappointment, I cancelled the hotel, and packed away the new dresses and sandals I had bought for my London wanderings, as well as my day dreams of drifting round London at my own pace, with no-one to please but myself, for a few days. However, the day before I had originally been due to leave, Derek unexpectedly suggested that I go anyway, but with some modifications to my original trip. I still had my BST ticket (non refundable, non transferable), and if I went for three days, not five, stayed here, not here, and generally took it easy with expenses, then it was do-able. I found myself, therefore, in the style of Bilbo running out of his Hobbit Hole without a pocket handkerchief, sitting on a train to London, not quite sure what I had thrown in my bag, checking I was not still wearing my apron, did not have toast crumbs round my mouth, double checking I had brought my BST ticket and wondering if I had left anything remotely resembling dinners, or clean clothes, for the family for the next few days. And yes, I had an absolutely wonderful time. Last year, Jacob fell in love with Andrea, and he fell hard. This is entirely understandable, as she is the sweetest, funniest, kindest, most adorable girl you could ever imagine. He decided, sensibly, to ask her to marry him, and laid his plans for a very simple, sincere, and beautiful proposal. He asked me, unexpectedly, the day before the momentous event, if I would be there to take photographs. I was honoured, and extremely excited, and instantly said yes. Hence, on the morning of the proposal, when Jacob and Andrea were driving to a pretty Inn outside Edinburgh for what Andrea thought was to be an overnight stay, I was driving there too, ahead of them. I parked behind a wall, and searched for a vantage point, from where I could discreetly take up position in the hotel gardens after they had gone inside to book in. I found myself lurking in some overgrown bushes opposite the Inn; camera in hand, hoping with some sincerity that nobody would approach and ask me just exactly what I was doing. That day I learned how hard it is to take photographs when tears of happiness are running unchecked down your face. Jacob proposed, with a ring he designed and commissioned, as unique as the lovely girl I now proudly regard as my daughter. And of course, she did say yes. If you are a long time reader of my blog (and if you are, thank you), you may remember that Isaac has had a tough time with his health over the past few years. I am extremely happy to report that we have finally had a diagnosis, and since then, life has improved for my boy. What has been rather unexpected is the fulsome blossoming of his personality in the face of better health. He has energy, enthusiasm, and stamina. His natural wit and humour has come to the fore, and his calm wisdom and counsel are overtly clear. There are very few people whose advice I would seek, but Isaac is one of them. He is wise beyond his years, and has a clear, logical, yet kind way of looking at the world that is truly beautiful. Nobody wants to receive a message at 11pm on a Sunday evening saying 'Jacob has had a fall, we are in A+E', however that was my experience some three weeks ago. Taut with tension, I threw a few essentials in a bag and set off for Aberdeen, arriving in the wee small hours of the morning, to find Jacob, lovingly and capably supported by Andrea, on a trolley in A+E. He had no sensation, movement or control from the waist down. He had slipped that afternoon, coming down the steps from his house, 'sober and undistracted' as he put it in his scholarly way, and was clearly in a bad way. An MRI revealed herniated discs in his lumbar spine, which were impinging on his spinal cord. This is a red flag situation, requiring emergency surgical intervention, if the patient is not to be left permanently disabled. With a nursing background, I had an inkling of how serious the situation was, but fortunately, at that time, Jacob was unaware of the severity of the situation. His consultant ('Call me Tosh') was outstandingly capable, and he and Jacob had an immediate rapport, which made the following hours marginally more bearable. Jacob was taken away to theatre, with Andrea by his side in to the anaesthetic room (it will take me a long time to forget watching his trolley being wheeled away down the ward; my darling boy waving, saying, 'Don't worry mum, I'll be fine'). Many hours later, around 1am, he came back to the ward. Surgery was successful. I will skip forward the gruelling days in hospital, as they are too painful to dwell on, however Jacob was amazing, and despite terrible pain, and life altering surgery, he faced his fears and challenges with courage and dignity, and walked out, 10 days later on two crutches, flanked by Andrea on one side, and me on the other. Pale, a bit clammy, but resolute; on his feet, and on his way. The nursing and medical staff were almost without exception, cheerful, kind, and accommodating, but it was a hard time. I was away from home for two and a half weeks, a truly unexpected journey. Andrea never left Jacob's side; her devotion was complete; what a test of their love, and how well they came through it. If you are a long time reader of this blog (and, again, thank you if you are), you will know that I took up quilting about three years ago, writing about my first attempt at making a quilt here. Since then, I have made many quilts, some of which I have written about on the blog, but many which have been made without fanfare or photograph. Some are in use at home, some have been given away as gifts, all have been a joy to make, and my love affair with quilting is pretty strongly established. In my last post, I mentioned that creatively I was 'almost' fulfilled. Amongst other things, I wished to become properly proficient at quilt making; learn more techniques, and possibly gain some sort of qualification. Browsing through options, I unexpectedly found what seems the perfect online City and Guilds course in Patchwork and Quilting, and after much discussion with Derek, and a bit of piggy-bank emptying, I enrolled on 3rd September on the C&G course 'Level Three Patchwork and Quilting', which is provided by the School of Stitched Textiles. I am excited, and nervous, but also determined and committed. I also hope to share my progress here on the blog. My final unexpected journey, as summer wheels steadily towards autumn, is back here to the blog. I hope, and intend, to be writing again more regularly again. Thank you for still being here. In our village, we have a village hall. Originally built as the parochial school in 1813, it is a sturdy stone building with the main hall and kitchen on the ground floor (don't you just love a village hall kitchen? ), and a smaller room upstairs, originally the teacher's lodgings. It is run by a group of volunteers who formed a Trust to take over the hall some years ago when it was threatened with closure, and is an asset to our village, and community. It is used by the scouts, the SWRI, the badminton club, the Zumba class, the Local History society, and various other committees and groups. One such group is the Beginners' Yoga class, where a group of village ladies spend an hour stretching, bending, contorting and perspiring every Thursday evening from 7.15 to 8.30. I have attended this class since last year, and just love every minute. However my favourite part of the evening is when our gentle teacher invites us to put on something warm and lie down for Savasana, or Dead Man's Pose. This is the well-earned relaxation at the end of the yoga class, and is quite delightful. My mind drifts off in all sorts of directions during Savasana, and I let it float freely, enjoying the scenes and memories this 'conscious relaxation' seems to bring forth. Often these scenes involve water, I have a sense of flying over the ocean, as if I were a seagull. I can almost feel the wind, and smell the water. Although in everyday life I am frightened of deep water, I find this sensation very relaxing when experienced during yoga. Some people put on socks and a sweatshirt for Savasana, some cover themselves with a fleecy blanket. Initially I covered myself with a cosy blue checked blanket which originally belonged to Jacob's room when he was a little boy. It is large, and soft, and warm. However after several months of yoga class I decided it would be very nice to have a quilt for yoga class instead. I wanted the quilt to approximate the ocean, starting at the bottom with deep sea creatures, then meander via smaller shoals of fish, wading sea birds and crabs towards the shore, as it appeared in my imagination, i.e. the top of the quilt. I gathered fabrics I liked over a couple of m0nths, searching on line and in my local sewing shop. I wanted the quilt to be simple in construction, and decided on horizontal stripes of differing widths. Once these were joined, I added a broad border all the way round (I wanted it to be large enough to avoid draughts seeping underneath at yoga class). The backing is pieced from left overs, and I rather like it. I marked out horizontal and vertical wavy lines with quilter's tape, and used the lines as my guide, hand quilting with perle cotton in navy, and white. I imagined the horizontal stitched lines to be the water waves, washing towards the shore, and the vertical stitched lines to be sonar waves, reaching right down to the deepest ocean. Of course, it is not perfect, but that's ok. I really like this quilt, and I'm not sure why, it is almost my favourite of those I have made so far. It was easy and quick to make, and I find the regular rows of fish and whales, crabs and seabirds soothing, as they march (or swim) solemnly across the quilt. Having used it for several weeks at yoga class, I am also pleased to report that it is very comfortable, cosy and perfect for Savasana. My mind seems to have moved on from water to snow-scapes now, so perhaps my next quilt will be inspired by snow; watch this (quilt shaped) space! Winter Project Link Party March 2017. A quilt for my sister. This winter I have been joining Jennifer at Thistlebear in her Link Party, where happy crafters share their projects and encourage each other along during the dark winter months. It has been such an enjoyable link party, and I am sad to see it coming to an end for this year. Do pop over to Jennifer's blog and see what other folks have been making this month. Today I am sharing another quilt project. I realise that with the recent flurry of quilt posts my life must appear somewhat charmed, as though I am constantly to be found stitching quilts with no other calls upon my time. Nothing could be further from the truth, but the nature of blogs is such that it is more pleasant to read (and write) about the more picturesque aspects of life, and quilting is certainly that. This quilt is a gift for my sister, who is celebrating a milestone birthday this month. She will be receiving gifts from all of us, but I wanted to give her something that was just from me. It measures approx. 49"x55"; a good size for throwing over the back of a chair or sofa, or tucking round cold legs on a winter's evening. After my lofty proclamations about fabric choices in my last quilt post, I of course ended up making this quilt entirely from charm packs. Pride comes before a fall even in quilting. I had two charm packs tucked away in the sideboard in the sitting room, and bought two more on line. I really like the richness of the colours, and the blend of fabrics, and enjoyed laying them out to achieve a random design, my only criterion being that no two identical squares should touch. I then simply machined them into rows, and then machined the rows together. Even with the squares being ready cut, I still managed to create somewhat off centre piecing (note to self: work on accuracy). For the backing I chose red and cream gingham; I really like the old fashioned effect of this fabric, it is gentle on the eye. I machine quilted in simple diagonal lines, then finished off with dark green binding, so the overall effect is rich and rather jolly, with a sprinkling of Christmas, or Little House on The Prairie, depending on preference (and the time of year). Overall I am happy with this quilt, though I know some areas are far from perfect. I am looking forward to giving it to my sister, and I do hope she likes it and enjoys using it. Thank you again to Jennifer for hosting this link up, and don't forget to visit her blog for more crafty goings-on. I started making this quilt during the Christmas holidays of 2015. I was itching to do a hand stitched project, and found a couple of 'Moda' charm packs in the cupboard, which I thought looked okay. I used them quite indiscriminately, only adding pieces I bought specifically for this project when I realised it was going to take a lot more fabric (and time, and effort!) than I initially thought. I have not worked on it continuously; it has lain fallow for months at a time, but I finally finished it yesterday. Now that I know how much time, and work, it took to complete, I would have chosen my fabrics much more carefully, as some of the patterns and colours are not fully to my taste. This is all part of the learning curve of sewing and quilting, and a lesson learned for the future. Starting a project now, fourteen months later, I am much more choosy about fabrics. However, I am very happy with the quilt over all; it has a happy, family, colourful vibe, and has been a joy to stitch. My plan is for it to knock about in the sitting room, to cover cold legs in the winter, and provide comfort and warmth to out-of-sorts family members, or even those who just want to feel cosy. I wanted to stitch a large hexie quilt, after my very first attempt at quilting when I made this, and wondered if horizontal lines of hexies would work, stitched on to a backing fabric. Alternating rows of blues and reds sounded bright and cheery, and as well as the aforementioned Moda charm pack (I think I used two packs, rejecting some of the fabrics as I went along) I used an old shirt of Derek's; a couple of fabrics from John Lewis, and a few pieces bought online, mostly from eBay. I backed them on to white cotton with a small blue dot pattern. Truth be told, I am not mad on that fabric, but I wanted something fairly neutral, but not completely plain, and chose it in a rush one day in John Lewis. I stitched down the long strips of hexagons to the background fabric, removing the templates one by one as I went along each row. The quilt ended up measuring about 60" x60" and quilting was hard on my fingers; with the haxagons being appliqued to the backing fabric, there was an extra layer to go through with each stitch, and my poor needle-pushing finger was in tatters. I can't work with thimbles, but found this handy little device which worked brilliantly, albeit after a little getting used to. For the quilting, I decided to simply outline each hexagon, using Perle cotton in white No 12. Being less than crazy about the background fabric on the front of the quilt, I was very careful when choosing fabric for the backing and border, and really love both. I bought them from my local sewing shop, which is a small oasis of beauty in the otherwise arid desert of our local small town. I decided half way through making this quilt (you can tell I was making it up as I went along, can't you? ), that I would try some needle turn applique, and plunged in to making a written motif to run along the bottom of the quilt. I hadn't the faintest idea of what I was doing, but managed, after a fashion, to cut out and stitch down the letters. I found it so satisfying to have something to read on a quilt. 'I ignored the ironing and made this'. The ironing baskets full to overflowing with neglected ironing will testify to this being factually truthful, though in all honesty I ignore the ironing for most things. The family also snorted in recognition when they saw my efforts 'Yea well that's true Mum' was Jacob's summation. Unfortunately it has not been possible to photograph this quilt outside. Where I would usually clothes-peg a quilt to the garden fence and photograph it 'whole', the weather currently is so stormy, and the garden fence so wet, that my newly finished quilt would instantly acquire a 'vintage' look. I will finish this post with a few more photographs of it on the 'big bed' as Jacob and Isaac used to call it, before they had double beds of their own. That's where quilts are really supposed to be, after all. 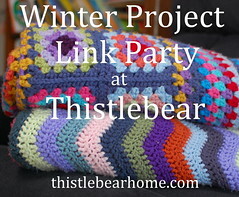 This winter I have been joining with Jennifer at Thistlebear, in her cosy Winter Project Link Party. Bloggers gather monthly to share their current wip's and generally support each other through the long winter evenings of knitting, sewing, crocheting, and much more. Do pop over to Jennifer's blog, it is a lovely place to visit at any time. This month I am sharing a knitting project. We have a new baby coming into the family in March of this year, and I am knitting him or her a baby blanket, which may or may not be finished in time. Thankfully new babies are unaware of lateness in gift giving, so I am not too stressed about it being ready exactly on the day. The blanket pattern is called Peek a Boo, which I think is an adorable name. It is very plain, with just a tiny bit of texture on it for interest. There are two sizes of blanket to choose from; I chose the bigger one (finished size 75cm x 103cm), which I hope means it will be in use for longer. Each row has 183 stitches, and one row takes 5 or 6 minutes to knit (I am not a fast knitter). There are more than 300 rows, so this project will take a while. My preferred yarn is mercerised cotton; for this project I am using Drops Muscat Mercerised Cotton, double knitting weight. I like the very slight sheen from this yarn, and enjoy the clean, crisp feel against my fingers as I knit. It gives a smooth, tactile finish, and I will I hope be beautifully comfortable against the baby's new born skin. I have chosen classic white to make the blanket, which is of course suitable for both pink and blue varieties of baby. The border is garter stitch, and the middle part is stocking stitch apart from the texture rows, which are very simple to do, thankfully. I am using a circular needle. Initially I was concerned that I would end up unwittingly joining the ends together at the end of a row, and I spent some time at the end of each row figuring out how to turn the work and restart, but I am used to it now, and find the circular needles easy and comfortable to work with. The double knitting weight of this yarn would usually indicate a 4mm needle, but I have chosen a 3.5mm instead, as I want a firm texture, and find smaller needles more comfortable to use. The blanket is still very portable, being only 50 or so rows deep at the time of writing, so it has already had a few outings. It has been with me to Isaac's guitar lesson; to a fund raising coffee morning, and on the school run several times (those minutes waiting in the car are too precious to waste). I keep it in a drawstring bag which originally came with a pair of Camper shoes. I have several pairs of shoes from there, and have made good use of both canvas and carrier bags; both are strong and well made (I like the shoes too!). I have had to temporarily lay aside the crochet scarf I wrote about last month, as the baby blanket will be needed before the scarf. I am also hand quilting a colourful hexie quilt, which I am looking forward to finishing; I feel I have been making it since dinosaurs roamed the earth; hopefully it will be finished in the next week or two. I hope I will have it finished in time to share on another Winter Project Link Party post. One of the greatest joys associated with learning how to make quilts has been gradually fulfilling my wish to make quilts for my family. Last spring I made a quilt for Jacob; in the summer I made a quilt for Isaac, and as the nights darkened towards winter, I made a quilt for my wee Mum, for Christmas. This quilt is not quite single bed sized, though it can be spread over a single bed without looking silly. It is far from perfect, but I am pleased with how it turned out, wobbles included. The inspiration for this quilt came from Mum's love of wild flowers, and of the walks she took as a child with my Nana, gathering wild flowers along the way. The colours are mainly soft greens, with lots of other muted pastels. The quilt is a combination of hand stitched hexagons and machine sewn log cabin blocks. It is made with a combination of Tilda fabrics, bought online, and some Lewis and Irene fabrics which I bought at my local sewing shop. I pieced and stitched six groups of hexagons, and then cut them into rectangles. It is hard to cut into hand stitched hexagons as they are so time consuming to stitch, but I needed six rectangles, so had to close my eyes to the sad little hexi halves that were discarded. I stabilised the rectangles with a narrow frame of green, and then added sashing to each rectangle. They were then stitched together and more sashing added. The backing is a lovely piece of fabric decorated with British herbs, and the binding is more of the same green fabric used within the quilt. My plan was to quilt the piece by hand, but the stitches seemed too conspicuous for the delicate colours and traditional feel of the quilt, so I machine quilted in simple diagonal lines instead, and was happy with the result. Mum loved it, and it has been tried in several locations in her house until she found a spot she was happy with. I am currently working on another hand stitched quilt, which I have been making on and off since last Christmas. I am hand quilting it at the moment and will post photographs when it is completed. I keep a notebook of quilt ideas, some of which I am sure will never be made, as I would need to live to be 200 to complete them all. I am constantly amazed that, even with my minimal sewing skills, pretty, personal quilts can be created and enjoyed. This winter I am joining Jennifer from Thistlebear, in her link party, where bloggers post their current crafty makes, and encourage each other through the long evenings of winter with lots of hand crafted beauty. The project I would like to share this month is a crocheted scarf I am making to enter in to this year's Dalmally Show. My crocheting career then lay fallow until minimally revived a few years ago, when I made another baby blanket (stripes this time), and I have made several other small pieces since then, so when I saw that a crocheted scarf was one of the competitions for the Dalmally Show this year, I dusted off my crochet hook and started looking for a suitable pattern from here . The name of the pattern is Land Girl Scarf. I considered the name very evocative, and also loved the names and shades of the wool used, all of which are place names in glorious Yorkshire, where Derek and I spent many happy holidays before the boys were born. Thirsk is a gorgeous market town, but despite this, I chose to change the tan colour to grey (an equally delightful 'Skipton'), as the colour tan sets my teeth on edge. The scarf is worked in a ripple pattern. I used ripple pattern I had used before, (from this book) as opposed to that specified in the pattern, as I am not a wonderfully confident crocheter, and preferred to use a familiar pattern. It is based on multiples of five, and gives a pleasingly uniform wave. I particularly like the stepped colour change, I think this gives the scarf an old fashioned feel which I like. I imagine a beret worked in the same stripe pattern would be adorable; not that I am going to attempt one, but it would be very 'Land Girl'. This is the scarf about half way finished. I am not looking forward to sewing in all the ends, but nor am I motivated to sew them in as I go along. An absorbing audio book and a big mug of tea will see me through that particular afternoon! The original pattern has two plump pom poms, one on each end, and they will be essential to the finished appearance. I made pom poms a lot as a child, using two rings cut out of cardboard, but they seem to have become very professional in recent years, with hardly a strand out of place. Not sure I will be able to achieve such a level of perfection with mine when the time comes. Here is the wool label, for those who like the look of the wool. The colours are beautiful, vibrant, yet soft. I still have sixty two rows to go, and am steadily ticking them off my list. Each row takes around four minutes. Now that Christmas is over, and life is settling back in to more of a routine, I should have the scarf finished reasonably soon, though I do have several other projects tugging at my time and interest, but that's a story for another time. Do remember to pop over to Jennifer's blog, and see what all the other Winter Link Party crafters are up to this month. This year I am joining with Jennifer over at Thistlebear, for her Winter Link Party, where bloggers post their craft projects over the autumn and winter months, and encourage each other along the way. Do pop over to Jennifer's truly heartfelt and delightful blog and read all about it. For my November Winter Project Link Party post I am sharing my most recent make; a Harris Tweed scarf, lined with Liberty lawn cotton. Harris Tweed is a unique fabric, proudly made in the Western Isles of Scotland. The colours are truly remarkable; complex, beautiful, and reminiscent of the remote and stunning landscape of the islands. Please read more about this truly amazing fabric here. I bought some offcuts of Harris Tweed when we visited the Western Isles during the summer, and amongst the pieces was a pretty length of pale blue, which was just the right size for a chunky winter scarf. I chose some co-ordinating fabric from my local sewing shop to use as lining, and, with right sides facing, machine stitched the lining fabric to the tweed along three sides. I left the lining slightly longer along the second long side, and brought it round to the front of the scarf, hand stitching it along the length to break up the plain blue at the front. Every Harris Tweed item is entitled to have a Harris Tweed label attached. I had a few tucked away carefully, but when it came to stitching one on to my scarf, they were so carefully tucked away that I couldn't find them. I improvised with a label from the sleeve of a Harris Tweed jacket of Derek's. Unfortunately this meant there was a tiny nick out of one side, but I tried not to mind about this small flaw. I am very happy with my scarf. It is extremely cosy. I wear it with the lining side next to my neck. Here I am wearing it; this shot taken today between chores when I realised I didn't have a 'live' photograph of my scarf! Do pop over to Jennifer's blog and catch up with all the other crafty bloggers joining with the Winter Link Party. This autumn and winter, I am joining with Jennifer over at Thistlebear, for her Winter Link Party, where bloggers post their craft projects over the autumn and winter months, and encourage each other along the way. Do pop over to Jennifers's truly heartfelt and delightful blog and read all about it. For my first Winter Project Link Party post, I am sharing my most recent craft project, a small(ish) tote bag, started yesterday, and finished this afternoon (much to the detriment of my domestic duties). Tomorrow, Isaac and I will travel to London, for the purpose of attending 'Harry Potter and the Cursed Child' at the Palace Theatre, on Saturday. These tickets were Isaac's Christmas gift last year, so we have waited a long time to go, yet it seems also to have crept up suddenly (perhaps in some Harry Potter-ish time turning manner?). There are certain restrictions regarding what can be taken in to the theatre (cameras, recording equipment, wands not purchased at Olivanders etc). All bags are security checked, and when reading the conditions of entry, I noticed with a pang of mild alarm that no bags larger than 41x31x16cm would be allowed in the theatre. Cue a comic scene of me measuring handbags, shoulder bags, tote bags, canvas bags, any and every bag that I own, only to find that they were either too large, or simply unsuitable for the trip. I was already planning to use a small, cross body bag for purse, phone etc, but with Isaac and I coming down from the outlying regions of the Empire to the great capital, we had both planned a little light retail therapy in the morning prior to our theatre visit, and a tote or shopping bag of suitable dimensions would be required. The obvious solution was to make one myself, well within the specified dimensions, so I selected some upholstery-weight fabric from my modest stash, and set to work. I cut out two rectangles of blue, 35cmx28cm, and a strip for the gusset, 10cm wide. I also cut out lining fabric in the same dimensions; I liked that the smaller, paler circles in the lining fabric complimented the bolder circles of the blue fabrics. My next step was to make a small rectangular front pocket, to add interest to the front of the bag, then on to the handles; just two strips of the blue fabric, folded in half and stitched down the long side, then turned inside out to hide the seam. I also made a little closure strip for the front, backed with the lining fabric, which I hoped could serve a double function: one, to keep the front pocket secure by means of a button hole and button; two, to close the main opening of the bag by means of a magnetic closure, situated inside the top opening of the bag. Following this, I inserted the ends of the handles between the lining and outer fabrics, and stitched right round the opening of the bag, twice, to secure the handles, and attach the lining to the outer bag. Finally, I secured the closure strip to the front of the bag, attaching a magnetic closure to one end, with the corresponding piece inside the bag, and making a button hole and button closure for the front pocket. At this point I discovered I had no idea how to actually make a buttonhole, but undeterred, I stitched a narrow rectangle with several rows of machine stitching, and then trimmed away the centre. It worked for me. My last task was to stitch on the front pocket. I realised that I should have done this as one of my very first tasks, before the blue fabric was even made into the initial bag shape, but as I am no expert in these matters (the phrase 'rank amateur' springs to mind), I squirrelled that knowledge away for another time, and instead hand, rather than machine stitched the pocket into position. Last tiny step; to sew on the button. Eagle eyed readers may have noticed that I changed my mind from the first, blue button I had selected, and instead chose a smaller, white, fabric covered button. It amuses me to think that I will be wandering the streets of London at the weekend with an unsophisticated, home-made, fun, tote bag. Isaac and I can shop with impunity on Saturday morning, and provided that no purchase is physically larger than this bag, we can be safe in the knowledge that we will be willingly admitted, for a few hours anyway, to the wonderful, wizarding world of Harry Potter. The first Saturday in September is a significant one for our family; it is the day of the Dalmally Show, which I have written about before here. We travel up to Argyll for the weekend, attend the show during the day, and in the evening, have a multi-generational ceilidh at my uncle's house, or more specifically in an enormous wind and watertight gazebo in his garden, specially erected for the occasion. Wonderful food, lots of wine, and good scots whisky (and of course non alcoholic drinks for the under 18's and drivers! ), stories, songs and music. Everyone who can, sings (and one or two who probably shouldn't do too!). This year Jacob sang and Isaac accompanied him on the guitar, singing their version of 'Time of Your Life' by Green Day; a proud moment for me. My nana, 96 and still going strong, loves the Show and ceilidh. She is such a sociable person, and every person present loves and respects her quite intensely. When I was growing up, we were a highly mobile family, who moved frequently, yet in many ways I still regard Dalmally as my true home. The family connections are strong, and so many of my maternal relations still live there. I also have a dream of living once more in our old home, which still exerts a strong pull on my heart. I believe that our family would have had a good life in this house, which we lived in for a few years when I was young. I have so many memories attached to this house, which sits beside the river, on a quiet, single track road that forms a winding loop away from the main village of Dalmally, eventually re-joining the main road some two miles later. This house was originally the general store and bakery for the people living along this beautiful stretch of countryside, and at the front of the house, there are still the huge, wooden double doors leading in to what was the shop. They are never opened now. I dream daily of living here again. In my imagination I regularly mentally renovate, restore, furnish and decorate this house. I reinstate the scullery off the big kitchen; I once again access the back stairs which lead to what would have been servants' quarters; I rebuild the big fireplace in the sitting room, and renovate to full functional glory those massive oak double doors at the front of the house. I imagine knocking through walls to create beautiful bathrooms leading off the large front bedrooms. I visualise a snug self-contained suite of rooms for house guests comprising bedrooms, a sitting room under the eaves, and a pretty shower room (I would want lots of visitors, this is a house made for company). Our old sitting room becomes my office/sewing room, just between the kitchen and the back door. The huge front room (once the shop) becomes a massive multi-purpose room; there is space there for all sorts of wonderful activities and events to take place. This is the home I imagine my boys eventually bringing their families to, where their children could run wild in the garden, or take the short path down the garden to the river, to play on the pebbly spit, throw stones, or just sit and watch the water. In short, this is the house I want to live in again. However, in reality, it would take a great deal more money than I am ever likely to have to buy it, and renovate it to the standard it deserves, nor is it currently for sale. I can't shake the dream though. Combine the house of my dreams, with views like this, and it is little wonder I feel so pulled to the north. Apart from stirring up memories and daydreams, the purpose of our annual trip to Dalmally is of course to attend the Dalmally Show. Much of the fun is entering our jams, bakes, makes and crafts in to the competitions in the Home Industries tent. For Mum and me, this is the highlight of our crafting year, and something we love to discuss and plan for in great detail (much to the amusement of my 'townie' husband). The lists of the various competitions are sent out in April each year, and can also be found on line here (pages 14, 15 and 16 are those which interest Mum and me). The schedule generates much discussion about which competitions or 'classes' to enter; Mum and I both love to make jams and preserves, so lots of ticks on that page. The knitting/sewing/crafting page has several fixed items which appear every year, such as a knitted baby garment, also a cross stitch picture, and piece of embroidery. This is where we diverge slightly, as Mum is a marvellous knitter (she can whip up kilt stockings with cables and complicated tops with ease), whereas I am not, though I do attempt an occasional knit for the Show. Then on to the all important Baking classes; it is difficult to enter bakes which are best eaten 'same day' like scones and pancakes, as of course our bakes are by necessity made in advance and transported north with care the night before the Show, so we tend to stick to larger cakes and bakes, or items which will still taste good a day or two after baking. After the decisions regarding classes comes the preparation. Crafts first, in April and May, all completed items carefully wrapped in tissue and put away, then preserves are made in June and July, and then in the days prior to the Show, baking is completed. This year was a particularly good year for us both, with quite a few prizes, and even a Trophy for mum (the Tullich Trophy, for most points in the Preserves section) as well as a Special Prize for her fruit tart (a particularly delicious apricot and almond one, which was devoured at the family ceilidh in the evening). I was also very lucky with my entries this year, and won quite a few prizes. In the Preserves section, I won a 1st for my Fruits of the Forest jelly; a 1st for my Lemon Curd, a 3rd for my Raspberry jam, and a Highly Commended for my Strawberry Jam. In the Home Baking section, a 1st for my Meat Loaf, a 1st for my Tear and Share Loaf, a 2nd for my Jar of Pasta Sauce (not pictured), a 2nd for my Empire Biscuits, and a 2nd for my Rocky Road Squares. In the Home Industries Section, a 1st for my Advent Calendar (I entered a box of numbered, decorated gingerbread biscuits, each one threaded with string, to hang on the christmas tree; I may replicate this 'for real' at Christmas! ), a 1st and Special Prize for Isaac's quilt (Any Other Handcraft) a 2nd for my Machine Sewn Shopping Bag, a 2nd for my Crochet Purse (Best Use 50g yarn. (not pictured), and a Highly Commended for my Patchwork Cushion Cover. Not all my entries were winners however; no prizes for my chocolate cake; coffee and walnut loaf, crocheted brooch, banana loaf, or my ladies knitted scarf. However, I was delighted with my prizes and Mum and I are already looking forward to next year's competitions. As for my dream of living in my old home, it will undoubtedly persist, and be once again stirred up to the point of painful longing when we return to Dalmally next year, and I see it once again, but that is the price I am prepared to pay for my beautiful, comforting day dream. I have made this quilt for Isaac in several bursts of activity, with long spells in between where it has lain untouched. Oh for the luxury of uninterrupted time to sew, and dream, and make. In my world, those precious hours absorbed in making and creating are few and far between. However, Isaac's quilt is now finished, and on his bed. I wrote about making Jacob's quilt ( here ).Jacob's vision was clear and direct. It was rather different with Isaac. Initially he wasn't sure he even wanted a quilt; then when he decided he would rather like one, his design ideas were entirely beyond my capabilities (this type of thing was suggested and quickly rejected by me; ditto this). Feeling rather out of my depth, I suggested a design based on squares, which was accepted (phew). Next to choose colours, fabric designs and general feel. This had to include guitars, plus other music themed fabrics, and the colours must be bright; bold, and include lots of orange and red. No problem. So I plunged in and, as before, bought some fabrics online, and some from my local sewing shop (here). I made the quilt up from several different blocks; all were easy to construct. My measuring and matching were not perfect, but I don't mind about that, and neither does Isaac. The back is plain white, with a single teal stripe. The stripe wanders a little, but I still like it. I quilted each block as the construction style suggested. It was time consuming, but most absorbing and enjoyable. I used perle cotton which pulls through the quilt layers smoothly, and creates thick, tactile lines of quilting. Now the quilt is at last on Isaac's bed, and he is happy with it. It has made me so happy to make a quilt for each of the boys during spring and summer this year. Each quilt reflects the boys' tastes and personalities and the stage they are at in their lives right now. I hope that as they grow up and forge adult lives they will still tolerate an occasional quilt from Mum! I started learning how to quilt last year, and consider myself a novice. I made my first quilt by hand last summer, and the Christmas quilt mentioned in this post last autumn. It was always my hope and dream to make quilts for my family to use and love, and my plan for 2016 was to complete a quilt for each of my boys (the first of many I hope). Jacob was very interested in, and enthusiastic about having a quilt made for him, and since the beginning of February I have been working on his quilt. I finished it late last night, stitching the binding at the kitchen table when everyone was asleep, and I gave it to him this morning. He had requested a quilt in greys, greens and camouflage, with a stag's head appliqued on a central panel. The overall feel of the quilt was to be as though made by an old trapper over-wintering in a log cabin in the wilds somewhere. With this vivid description I could see the quilt very clearly in my mind's eye, and although the end result has some mistakes and a few wobbly bits here and there, I really don't mind; these 'irregularities' probably fit the brief! The fabric came from various sources; an old camouflage jacket of Jacob's which I filleted, saving the breast pocket and a cuff, with the idea of incorporating them into the quilt. Billow Fabrics was an excellent source of quilting cotton, and eBay also provided rich pickings. The 'running hare' fabric was a tote bag from Habitat which caught my eye in the January sale. The wadding is Hobbs Heirloom cotton. The 'tartan stags' backing fabric (the 4th picture in the collage, above) is a brushed cotton duvet cover, bought online. The quilting is simple diagonal lines, hand stitched in green quilting cotton. Photographing a 70" square quilt outside in a stiff breeze this morning was something of a challenge, but a few clothes pegs secured the quilt to the garden fence, and the brushed cotton of the quilt's backing fabric found purchase on the weathered wood of the old garden bench, holding it securely whilst I took a few photographs. After photographing, it was smoothed into place on Jacob's bed, where it looked instantly at home. I have mentally handed it over to him now, and don't mind if it gets crumpled, or has tea spilled on it, or lands in a heap on the floor. It is there to be used, and loved. There was not one part of making this quilt that I did not enjoy. Everything from discussing it with Jacob, to choosing the fabric, cutting and sewing the blocks, piecing the top, even the tedious business of basting the quilt sandwich; each step was absorbing and interesting. Someone told me that a well made (i.e. secure) quilt will last a hundred years. That fact fills me with untold pleasure. I hope Jacob will continue to use his quilt for years to come. I know I will make other quilts for him, but I have a feeling that this first quilt will always hold a warm spot in his heart, and in mine. In the lull between Christmas and New Year, I meander through the days in a pleasant stupor. The high excitement of Christmas Day is over, New Year is not quite here, and there are few deadlines, apart from meals and dog walks, both of which have assumed a wandering quality, taking place at any time between waking and sleeping (waking and sleeping arrangements also having taken on a certain fluidity), and pleasing everyone just the same. Days are spent reading, sewing, catching up with television, and throwing the occasional wash through the machine, or filling the dishwasher. I am glad when the afternoon darkens, and I can light the candles I have scattered all round the house; partly to enjoy their flickering glow and gentle light, and partly to conceal the fact that the floor hasn't been mopped for days. The house is still full of festive food, and all of it more than edible. We now avoid turkey at Christmas, as no-one ever wanted to eat it the next day. The leftover meat would be frozen on Boxing Day and made in to a curry sometime in February (which nobody wanted then either). After several years of this pointless ritual, coinciding with my meat consumption plummeting to virtual vegetarianism, with the very occasional bacon sandwich, we changed our Christmas Day feast from turkey (with all the trimmings), to ham, beef, and fish (with all the trimmings). This ensures plentiful feasting on the day, genuinely tasty leftovers for many days afterwards, and almost no waste. Minimal food preparation and ignoring the house being in a state of dusty disarray, I have plenty of time for reading, and have a pile of delightful bookish gifts to enjoy. I am currently reading Laurie Lee's 'Village Christmas And Other Notes on The English Year'. The writing is sumptuous; lush, specific, poetic, beautiful. Post Christmas, I also finished my first full- size quilt, which I had been working on throughout the autumn. I have spent the last couple of evenings stitching the border. As I had opted for the aforementioned candlelight, this felt rather Bronte-esque, stitching diligently in the dim light as the storms raged outside. Here is the finished quilt draped over Isaac's legs. I had barely finished the last stitch when it was pressed into sofa service, which is just as it should be. A quilt's eye view of the television. I hope your days in the lull are equally pleasant (and perhaps that little bit more organised than mine). Happy festive times. The Dalmally Show: a red letter day. In every family, there are certain red letter days, unimportant to the rest of the world, but of great significance to those involved. Such a day for our family is the first Saturday of every September, when we attend the Dalmally Agricultural Show. Dalmally is a village in Argyll, in the southern highlands. It is in Dalmally that my heart lives, specifically in a big white, gabled house with a huge garden running down to the river Orchy. We lived in this house when I was a child, and I still yearn, daily, to live in it now. The village of Dalmally has myriad childhood memories and family connections. Mum's family come from there, my parents met there, and many of my relatives still live locally. To have a weekend every year, when we attend the show, and have a big family ceilidh in the evening, means that Dalmally Show weekend is a much anticipated date in our family calendar. "Saturday 5th September 2015: Dalmally proudly presents its annual agricultural show; a celebrations of rural community and local produce. This is a well attended show where you will enjoy a range of attractions including the agricultural events on which the show was founded many years ago. These include judging of highland and commercial beef cattle; black face sheep, poultry, dogs, baking, preserves, horticulture, photography, painting, shinty match, trade stands and more"
What we are primarily interested in is the Industrial Tent. This is where the cakes; biscuits, scones, jams, jellies, and crafts are displayed and judged. This tent is where a competitive spirit, dormant for 364 of the 365 days in every year, comes gushing forth like a well spring, and otherwise composed, gentle folks (like my wee Mum and me) reveal a hitherto unsuspected killer streak. The excitement begins in April, when the show schedule is sent out, and initial decisions are made about which competitions, or 'classes' we will enter. Then comes the preparation. Knitting, sewing or crafts are done first, and stored away carefully. Jams and jellies next; the best jar from each batch put aside for the show. Last comes the perishables; cakes, biscuits, scones, dumplings, pancakes, all made in the few days prior to the show, then transported north the night before (Dalmally is about 70 miles away), in tins and boxes, to finally be delivered to the show ground early on the morning of the show. Those of us who have spent the preceding weeks or months preparing our knitting, sewing, jams, crafts and cakes, lay out our entries, have a last fuss and fret over them, eye up the competition and leave, as the tent closes for a few hours for the all- important judging. The boys enter competitions too. Now regarding themselves as too mature for the Childrens' tent, they take their chances with the adult classes, entering photographs, the occasional cake, bake, or craft item. After leaving our entries to be judged, we go for breakfast, discuss our entries (again), then return to the show late morning. By this time, the crowds have started to arrive, the pipe bands are tuning up, the smells of hot dogs, venison burgers, coffee and beer are adding their aroma to the distinctive whiff of cattle, and most importantly, the tents have re-opened after judging. Now we find out what, if any prizes we have won. This year was a good year. Jacob got a 2nd for his 'item made of wood', a beautiful toolbox. Sadly Isaac did not get placed for his beautiful lemon drizzle cake, but we all ate it after the show, and agreed it was the best non-winning lemon cake we had ever tasted. I was not placed for my strawberry jam, or my carrot cake, or my custard creams, or my child's knitted pom-pom hat. However I was a little more successful with my cakes. My Celebration Cake, Lemon Drizzle cake and Black Forest Gateaux were all 1sts, and my Lemon Drizzle also earned a Special Award. These together meant that for the first time ever I won a cup, for the overall winner of the largest classes in the baking section. This was very exciting. My preserves did quite well too. A 1st for my raspberry jam (a lucky punnet of raspberries I think), two 2nds for spiced tomato salsa and matrimony jam (a jam made from two complimentary fruits, mine was cherry and blueberry), and two 3rds, one for lemon curd, and the other for fruit jelly (I made mandarin). No photographs of Mum's preserves, but she did exceptionally well, and won a cup (also for the first time) for the most points in the preserves section! Highly Commended for my knitted wash bag and make up bag, and another for my quilt, which I hand stitched on holiday in the summer, and a 3rd for my button bracelet. I have never made a button bracelet before, and found it a little fiddly, but was happy to be placed 3rd. My favourite entry, and the one I was most delighted to win, was in the class for 'best use of 1 metre of fabric'. For this entry, I lined a vintage basket, and covered three books. I made a padded glasses case, a mug cosy, and covered a little tin for biscuits. I made a little caddy for a single teabag. I called my entry 'Tea, biscuits, and a good book'. I was delighted that Mum got 2nd in this class too, for her beautiful child's sun dress, with a little bag, and hairband, and covered hanger. After the show, in the evening, we had a fantastic family ceilidh; all generations eating, drinking, singing, laughing and story-telling together. This too is an annual institution, and one we would hate to miss. The youngest family member there is 12, the oldest is my redoubtable Nana, who at 95 is the Matriach of the family. She attends the show during the day, and examines all entries with a learned eye. She has been winning baking, preserve-making and gardening competitions for more than seven decades; she knows a good entry when she sees it. She takes a note of exactly who has won what, remarks on how well deserved or otherwise the awards have been, and more remarkably still, remembers what prizes were won the year before. After touring all the tents at the show, she settles down on a camping chair to watch the shinty, which she follows assiduously, and at night, she attends the family ceilidh. She makes a small concession to her mature years by leaving before midnight, but when we visit her next morning, she is up, dressed and ready for an eager discussion about the show, local and family news (aka gossip) and usually sends us on our way with a few pots of her home made jam. Next time I will share some more photographs of other, non-family entries to the show, and a few more views of gorgeous Argyll. I have wanted to learn how to quilt for a long time. The world of quilting appeared inviting, beguiling, but a bit intimidating too. I noticed beautiful quilts everywhere. They caught my eye in films, perhaps draped cosily over a sofa; or plumply folded at the end of a bed, implying hospitality and welcome. They popped up in books, warming and comforting characters who were ill, sad, or chilled. I read about quilts, I looked at them in museums. Quilts documented significant events. Quilts stored family history in their folds. Quilts were made to celebrate weddings and births. Quilts were sent away with grown children to college and new jobs. Quilts seemed to cast a homely spell, distilling the essence of love, family and home within their folds, to be used when the recipient needed warmth, or the comfort of home. Derek, having heard me say many times how much I would like to learn to quilt, surprised me on my birthday this year by booking me on a 'Quilting for Beginners' course. (He is an excellent gift-chooser!). Inspired and motivated to do some ground work before the course, I decided to take the plunge and try to hand sew a quilt whilst we were on holiday in Wales. One the right size to nestle under on the sofa, or throw over the back of my desk chair; big enough to be useful, small enough to be realistically achievable over the summer, seemed a sensible plan. I had heard the phrase 'English paper piecing' and after reading a little about it, thought it seemed suitable for a first attempt. I started basting the pieces onto the paper templates on the long train journey to Wales. It was quick to do each one, and enjoyable, but I had no real idea of how many hexagons I would need, how they would look, or if they would ever become a quilt. The fabric I used was soft furnishings weight, not a conscious choice, just what I had to hand, and this gave considerable heft to the quilt top as it grew, which I rather liked. The evening before we left Wales, I stitched the final hexagon in place. Here, then is my Sugar Loaf Quilt. It was made with great enthusiasm rather than great skill, but I really do love it. The finished size is 125cm x 70cm, just about right for keeping legs warm and general sofa comfort. Amazingly, though it is very old fashioned and quite pink, both boys like it and have watched its development with some interest. I rather like (even prefer?) the back. I learned such a lot making this quilt, and found every moment stitching it hugely satisfying and enjoyable. I began to understand, rather than just imagine, the charm of quilt making, and the pleasure the finished article can bring, even if it is imperfect. There are few things in this world that make me happier than a pile of new books. In the spirit of new year's resolutions in January, I committed to not buying any new books until my 'to read' shelf had been thoroughly explored, and I have stuck to it pretty well. I have resisted the lure of Amazon's 'Recommended for You' page, and bought books only from charity shops or borrowed them from the library, with the exception of books for my book group, though I very conscientiously selected a book from my 'to read' shelf when it was my turn to choose. However, I did have a 'get out of jail card' in my possession, in the form of a book token, which I had been hoarding for some months. Derek had very kindly gifted me a quilting course for my birthday earlier this month, to start in August, and this presented the perfect excuse for a trip to Waterstones to look for a quilting book. Derek had already given me 'Homemade and Happy' by Tone Finnanger, (he really is an excellent gift-chooser!) so after a delightfully lengthy browse I chose 'Quilt Me' by Jane Brocket; full of inspirational ideas for quilt making, and fearless in the choice of fabrics used. I thought this would be a very helpful counterpoint to the rigid 'rules' of quilting I will be exposed to during my course! I have recently become fascinated by the Bloomsbury Group, and when I saw 'The Bloomsbury Cookbook' by Jans Ondantje Rolls I swooped on it like a merlin; I love a cook book that combines recipes with background information, and this book is a rich resource. It has hundreds of recipes, some sourced directly from members of the Bloomsbury Group (or more accurately from their cooks), some from 'Good Things In England' by Florence White, some from the author. It also contains drawings and paintings by the Bloomsbury Group; excerpts from their letters and diaries and lots of other biographical information. I find 'straight' biographies deadly to read; making food and recipes the focal point appeals much more. I have since sourced 'Charleston' and 'Bloomsbury at Home' from Amazon marketplace for the purposes of cross-reference, which purchases I thought acceptable within the 'no new books' rule as they were second hand. In that peculiar way that sometimes happens, when your interest is piqued, you see references to the subject everywhere. In the back of a weekend magazine supplement, I found an article about Vanessa Nicolson, granddaughter of Vita Sackville-West , member of the Bloomsbury Group, now cut out and tucked away for future reference. Mary Addison also mentioned the Bloomsbury Group recently on her excellent blog, which appears prima facie to be about embroidery; but is also about botany, baking, religious festivals, books, fashion, paintings, history and so much more. Finally, reading recently about Caroline Zoob's embroidery, I learned that she lived in Monks House, Virginia Woolf's Sussex home, and in that delightfully cyclical manner that the universe loves to provide, has written a book about it. I have a soft spot for Stirling Castle. It is about 40 minutes from our village, and I have visited many times, several of those as a Mummy Helper on school trips in the dear departed primary school days. The majesty of the castle was a bit lost on me on those occasions, as I spent most of the time anxiously counting and re-counting heads; the weight of responsibility of other peoples' children weighing heavily on my shoulders. However it was with a light heart and sense of happy anticipation that I visited the castle a couple of weeks ago, specifically the Great Hall, to view The Great Tapestry Of Scotland. The Tapestry is the brainchild of Alexander McCall Smith (of 'The No1 Ladies' Detective Agency' books fame), in consultation with Alistair Moffat (historian), Andrew Crummy (illustrator) and Dorie Wilkie (group co-ordinator and stitch supervisor), plus many others. It tells the story of Scotland via embroidered panels and is fully explained here. The scale and proportions of the work are breath taking. Scotland is represented from the time the land masses of the world formed, through to the present day. Each panel has a central motif, with borders showing related objects, people or places. I am not an embroiderer, but even to my untrained eye, it is clear that the stitch work is expertly done; complex, exact, exquisite. On a corner of each panel is stitched the initials of the (mainly, though not exclusively) women who worked it. Many of the panels were stitched where the historical event depicted on the panel took place. The texture of the stitch work is rich and varied, from lace, delicate as a cobweb, adorning the neckline of a dress, to tight whorls representing sheep's wool, and dense chains and tufts bringing rock, sea and hill vividly to life. Colours start from the browns, greys and blues of rock, sea, sky, land, in the early panels, and the plain clothing of the settlers, crofters, farmers and labourers, through to the richly decorated robes of the wealthy, and of course tartan plaids and skirts; from the original, belted plaids, to the formal, 'dress' kilt introduced by the Victorians. It is hard to describe the impact of seeing the tapestry in its entirety. From inspiration, collaboration, consultation, design; then to recruitment, instruction, co-ordination and final presentation, it is a monumental achievement. That the energy, goodwill and skill was all out there, just waiting to be harnessed, and put to such good use, is immensely encouraging. The tapestry is currently on tour, but it is anticipated that it will eventually have its own, custom built gallery in the Scottish borders. If you get the chance, do go. The kitchen table is my favourite spot to work when I have some time to myself. It's close to the kettle and the radio, with good overhead lighting and plenty of space to spread out. My rather wobbly crochet, destined to be a bag, using the shell pattern on p78 of this book. This article, about one of my favourite authors. My bag, the contents of which I shared here. A cup of tea; essential for any comfortable evening's activity. Assorted yarns, pencils, crochet markers, scissors. Where do you like to settle down for a spot of work?